This is an exciting age group to be coaching! Once players have progressed to a point where they'll be using u8 soccer drills, they should already have a solid understanding of the basics of soccer. Now it's time to progress into more advanced skills, introduce more competitive play, and start shooting / passing from longer distances. 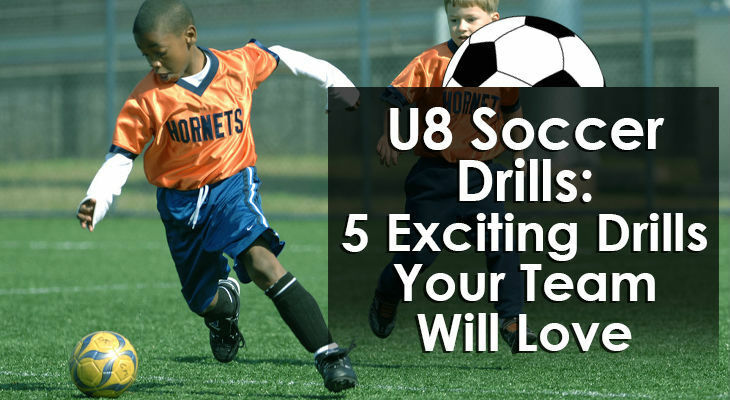 On this page I've put together 5x U8 soccer drills which are perfect for this age group. Players compete in a 1-on-1 game to gates to test their attacking and defending skills. Evaluate players’ ability to defend attackers in open space. Defenders are asked to close down space quickly and keep the attackers from getting past them. Players are able to showcase their attacking and defending skills. See diagram below to follow along. Mark a square 25x25 yards with cones. On opposite corners, make a gate with two cones. The other two corners will have just a single cone. Pick a corner with a gate, on each side of the gate, along the sideline, position a different colored gate, 12 yards away. These will be the scoring gates and should be four yards wide. Divide the players into two groups. Have one group start as the defenders behind the gate that is positioned closest to the scoring gates. The second group will start as the attackers and will start behind the corner gate opposite of the defenders. All of the balls start with the defenders. The first player in each line starts between their respective gate. The defender starts with the ball at their feet. The remaining players behind them should stand to the side of the gate. If there are more than 12 players in the exercise, make another setup so that players can receive more repetitions. Play four, five-minute games. Players should play two rounds as the attacking group and two rounds as the defending group. The activity begins with the defender passing the soccer ball to the attacker on the opposite corner of the square. The pass should be on the ground and to the attacker’s feet. The attacker receives the pass as the defender runs forward to close down the attacker’s space. The attacker attempts to beat the defender and dribble through one of the three possible gates. The two gates to either side of the attacker are worth one point while the gate the defender started from is worth three points. The defender attempts to prevent the attacker from scoring in any of the three gates. The defender can score their own points by winning the ball from the attacker and dribbling through the attacker’s starting gate for three points. If the ball goes out-of-bounds for any reason, the turn is over and both players return to the back of their starting lines. The next turn can start as soon as the field if cleared. Players keep track of their own points. The player with the most points after each round is announced the winner of the round! After each round, players should switch lines/roles to work on both sides of the ball. Make sure the players resting do not stand in the way of any gate as players will be attempting to dribble through them at high speeds and could cause collisions. Play four, five-minute rounds with each player playing an equal number of rounds as the defender and attacker. Size ­– Change the dimensions of the activity to fit the quality and athleticism of the players. If the dimensions are too easy for the attackers or defenders, adjust accordingly. Teach the defenders to close down the attacker’s space as quickly as they can and then arrive on balance. Remind the attackers to be creative and decisive with their changes of direction! Educate the defenders to bend their knees and time their tackles so they are not caught reaching for the ball. Challenge the defenders to win the ball every time and score points on the attackers! Encourage the attackers to use fakes, change of speed, and moves to get past the defenders and score! Two attackers play against two defenders and attempt to score by dribbling into their opponent’s end zone. One of the best u8 soccer drills for developing a players’ abilities to take advantage of 2v2 situations. Players improve their ability to dribble past defenders and advance the ball forward on the dribble or pass. Set up two field 20x25-yard fields. Mark out a five-yard end zone on each end line of each field. See diagram for clarification. Divide the players evenly amongst the four end zones. Assign matching jerseys to each end zone group. Two players from each team start inside the end zone while the other players rest to the side of the end zone. Players rotate after every repetition. One end zone on each field starts with the soccer balls. This end zone will always start the repetition by passing the ball across the field to the players in the opposite end zone. Play three, six-minute rounds. Make coaching points and rotate players after each round. One player from the end zone passes the ball across the field, to the players in the opposite end zone. One of the players in the opposite end zone, receives the pass and then dribbles into the field. At the same time, the players from the end zone that passed the ball, run across the field to defend their opponents. The two teams play 2v2 and attempt to dribble into each other’s end zone for a point. If either team scores, or the ball goes out-of-bounds for any reason, the turn is over and four new players start a new ball from the same end zone as the previous four players. Play for six-minutes before resting and making coaching points. Rotate players and teams as needed. Play three rounds. Competition – Have the teams keep track of their points! Team with the most points at the end of each six-minute round is the winner! Width – Decrease the width to make it more difficult on the attackers. Increase the width to make it more difficult on the defenders. Teach the defenders to close down the attackers quickly. Get the attackers’ heads down! Share with the attackers some change of direction and speed tips to get past the defenders! Challenge the defenders to win the ball and transition to their opponent’s end zone for a point! Two teams of five attempt to score in their opponent’s two mini-goals. After every pass, the passer must run around the nearest cone, along the outside of the grid, before being able to receive the ball again. Develop team possession and individual passing, dribbling, and decision-making skills. 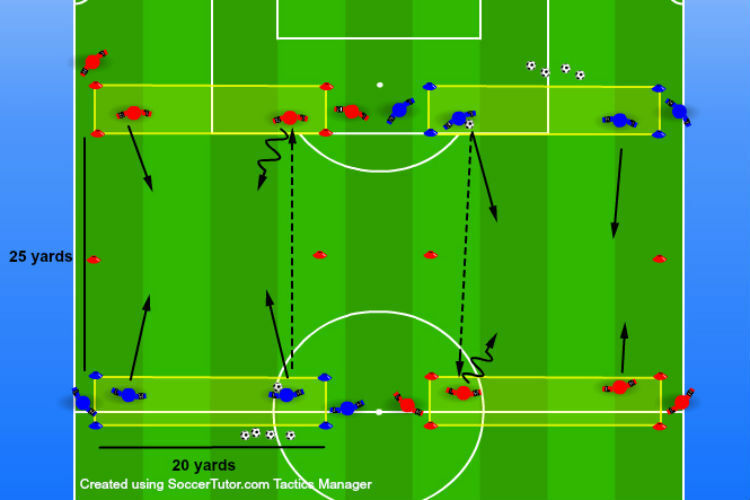 Improve players’ movement after completing a pass. Set up a 35x30-yard field. Make sure there are at least four cones on the four sides of the field. These will be the cones players must run around. Place two goals on each end line. The goals should be 20 yards apart. If mini goals are not available, use cones to create three-yard wide gates. Divide the players into two teams of five players and assign jersey colors to each team. If there are more than two teams, have the third team rest and rotate in after each game. Gather all the soccer balls on one sideline for players to use if the ball goes too far away. Each team should play at least three, four-minute games. Add more games or time to fit the training needs. Rest and make coaching points between games. Teams play 5v5 attempting to score in their opponent’s mini-goals. Each time a player completes a pass to a teammate, the player that passed the ball must run around the nearest cone before being able to receive the ball again. One point is awarded each time a team scores. Play four-minute games. Rotate teams after each game. 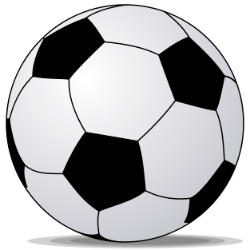 No goals – The game is played without goals forcing teams to try and maintain possession for as long as possible. Same rules apply. Teams are awarded one point for every five consecutive passes they complete. Number of players – Add or subtract players to meet the training needs. Adjust the field size accordingly. Neutral players – Add one or two neutral players to help the flow of the game if needed. Adjust the field size according to skill level and focus. Encourage players to run around the nearest cone as fast as possible so they can rejoin their team in possession and provide a passing option. Challenge the players to protect the ball while their teammates get open. Players may need to take a touch or two before their teammates adjust their support angles. Stress the importance of communication and teamwork. Remind the players to have an idea before they receive the ball. Players should constantly be thinking what the next two or three actions of the game should be. Five players attempt to keep possession against two defenders inside a circular-shaped playing area. 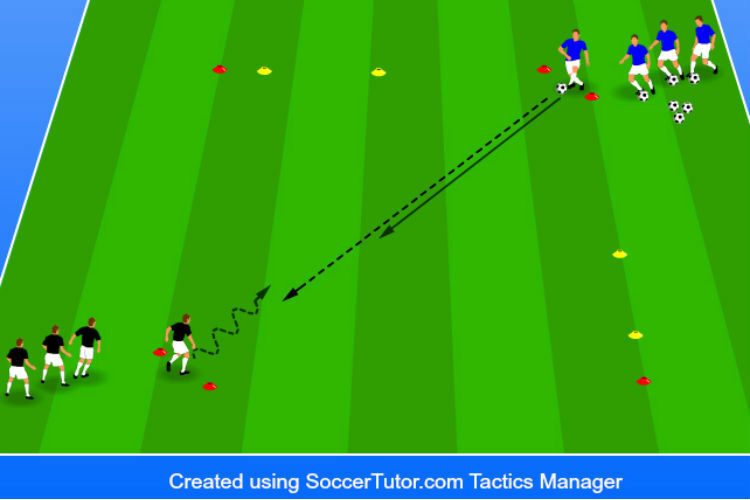 Develop passing and decision-making in a simple possession game. Divide the players into groups of seven. Have five players form a 10 yard in diameter circle. Adjust the size of the circle according to the skill level. The remaining two players in each group start inside the circle. One of the outside circle players starts with a ball. Play for 10 to 15 minutes. Add breaks and coaching points as needed. The players on the outside attempt to keep possession of the ball for as long as they can while the two players inside the circle attempt to win the ball. Outside players are encouraged to move along the outside of the circle. If the defense intercepts, or knocks the ball out-of-bounds, then the defender who has been in the longest switches spots with the offensive player who lost possession of the ball. Play for 10 to 15 minutes. Add breaks and make coaching points as needed. Different number of players – Play 6v2, 7v3, 4v2, 4v1, 3v1, etc. Adjust the size of the circle depending on the number of players. Touch limit – Give a three, two, or one-touch restriction to the players on the outside. Count the passes – Add a layer of engagement to the activity and make the players count the number of passes they complete. Encourage them to get the highest number possible. Defenders stay in – Make it fun by adding some new rules. Passing the ball between a defender’s legs, 10 consecutive passes, or passing the ball between the two defenders, means that the defenders must defend another round after they win the ball. Adjust the circle size according to skill level and number of players. Teach the players to move when they are on the outside to give good passing angles to their teammates. Players should not be standing on the outside! Challenge the defenders to win the ball as quickly as possible. Defenders should work together and make it difficult for the outside players. Encourage players to be creative and decisive! Players should have an idea before they get the ball to increase their speed of play! Develop ability to finish at various distances in quick succession. Players improve their shooting techniques and finishing consistency. Set up a full-size goal at one end of the field. Position one goalkeeper in the goal. If there are extra goalkeepers, position them outside of the goal and have them rotate in every six shots. Two players start as designated passers and position themselves on each side of the goal, five yards off each goal post. Designate one passer as the mid-range passer and the other as the short-range passer. Set up a cone eight yards outside of the penalty box and have the remaining players form a line behind the cone. If there are more than six players in line, try setting up two fields so players can receive more repetitions. The soccer balls should be divided up evenly between the player line and the two passers. Each player should complete at least 10 turns. Add more repetitions if time allows. Rest and reset the soccer balls as needed. Rotate passers every few minutes. The first player in line takes one touch towards goal and then shoots the ball from outside the penalty area. Immediately after the player takes their first shot, the mid-range passer completes a pass to the penalty area for the shooter to run on to and finish in one-touch. Immediately after the second shot, the short-range passer completes a pass to the six-yard box for the shooter to run on to and finish in one-touch. Rotate the designated passers every few minutes. Each player should complete at least 10 repetitions or turns. Add more repetitions if time allows. Rest and reset the soccer balls as needed. Make coaching points during natural stoppages. Volleys and headers – Passers hand-toss balls in the air to the shooters. Shooters must decide if they are going to strike the ball out of the air with their foot or head the ball. Shooters only get one-touch. Vary the distance – Adjust the distance depending on the players’ age and skill level. Players should take a quick glance up before shooting to see where the goalkeeper is positioned in front of the goal. Remind players that since they are running on to the ball, they do not need such a powerful foot swing, but rather a short, smooth motion to redirect the ball into the goal. The players forward momentum will provide the power needed to finish the ball. Stress that players maintain a locked ankle position when striking the ball. This will ensure a more accurate shot and better finishing consistency. Challenge the goalkeepers to get to every shot. Goalkeepers should immediately bounce back up after making a save and react to the next shot!